Members of the first graduating class from Graham High School in 1958 hold up a photo taken in April of that year, before eating lunch at their reunion in the Graham High School cafeteria on Friday, July 13. Organizers said there were 58 members of the original graduating class and 21 classmates at this reunion. Classmates began meeting annually after the 50th anniversary reunion, but typically meet at St. Paris Lutheran Church. 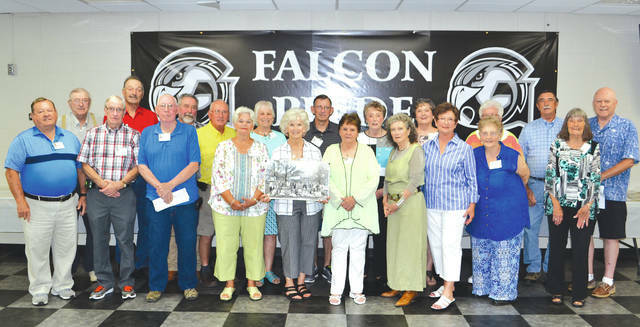 Many members of the 1958 class said they were looking forward to a tour of the school building during the reunion.